Are Motorized Shades Worth It? Here's Why the Answer Is Yes. If you have a residence in Manhattan, you already know the most significant benefits that come with living in the city that never sleeps. You’re never too far from the action – whether it’s eating at the hottest restaurant or seeing the newest Broadway show. There’s always something happening in New York City. Chances are, if you’re living in Manhattan, your residence also has a spectacular view of the city’s skyline or even the East or Hudson Rivers. This begs the question: Are you making the most of your unit’s view? If you don’t know the answer to that question, we have a solution: Switch out your regular blinds for motorized window treatments. What, exactly, can motorized shades do for your Manhattan residence? Below, we share three reasons why it’s a worthy addition to your property. Manually rolling your blinds up and down can be a hassle – and time-consuming. Why not have the option to control your shades at the press of a single button? Instantly after you press a button either on an in-wall keypad, touchscreen, remote or even a smartphone or tablet application, your blinds quietly will raise or lower within seconds. This grants you easy access to your favorite views from your unit without the need to manually adjust the blinds yourself. You even can connect your motorized shades to a sensory or automation system so that they can roll down at the moment direct sunlight enters your space. Even while your blinds are rolled down, you can choose a shade fabric that still allows for a view of the city. When direct sunlight hits, how can you protect your residence from glare or harmful UV rays that could damage expensive artwork and furnishings? Direct sunlight sensors can work with your motorized window treatments so that they automatically can lower without you even pressing a button. Not only can you keep your assets safe, but you also can have peace of mind throughout the day. If your unit faces west, for example, you might enjoy a view of the skyline during your morning routine. But when you arrive home in the afternoon, you might face direct sunlight. With motorized window treatments, you won’t have to ever worry about manually wrangling the blinds every day to account for that change. The automated system allows you to always make the most of your view – while still protecting your favorite assets. While motorized blinds certainly are a boost to your residence’s aesthetics, they also provide real energy-saving benefits. During the wintertime, for example, you can use honeycomb shades within an automated system that roll down once you leave for work and rise when you arrive home so that you can enjoy your view. Although these shades don’t allow for a view of the outdoors when rolled down, they are extremely effective at insulating the heat that is attempting to escape your unit through windows. That way, you don’t have to spend as much on warming your residence during the cold season. When the temperatures once again warm up, you can switch to using roller blinds that allow for a view of the outdoors – even when they’re rolled down. With a silver backing, however, these blinds can reflect sunlight trying to enter your unit so that your residence stays cool no matter how warm it is outside. 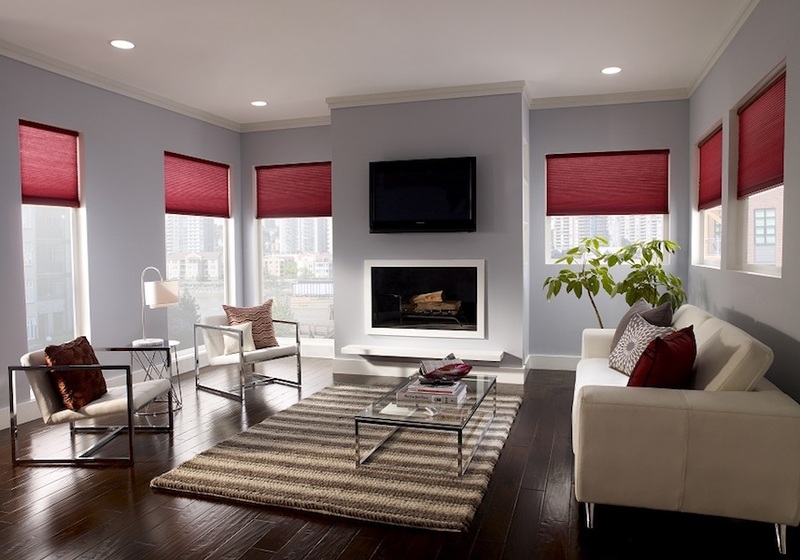 Motorized shades can be a versatile and worthwhile addition to any Manhattan residence. Here at Zeus Integrated, we’re expert motorized window treatment installers and are available to answer any questions you might have. To reach out, we encourage you to either call us at (800) 878-9705, chat live with us by clicking at the bottom-right corner of your screen or fill out a short form on the page linked below. We look forward to assisting you! Ask Your Motorized Shades Question Here!